Who doesn’t like apple pie? And this is the perfect season! Apples are in season, bountiful and selling for great prices! And with cooler weather it’s so nice to turn on the oven and have cinnamon, nutmeg and baked apple smells wafting through the house! Smells of fall! I’ve not yet found the perfect recipe for grain-less, egg-less pie crust. I found this recipe on Cross Fit Murrieta and it comes pretty close. I really liked the flavor and it was a great addition to the flavor of the pie, but the only downside I could see was the fact that it doesn’t come out of the pie dish like a typical pie crust does. I was kinda disappointed that I couldn’t scoop out a piece with the pie server… it just fell apart. The taste of this pie was fantastic and will probably be our family’s go to, but certainly not a pie that I would take to Thanksgiving dinner, unless I can perfect the crust between now and then. But realistically… I don’t think we could eat that many pies! The kids had been asking for desserts and they were saying we hadn’t had anything in a long time. And I tend to believe them… I don’t think we have had many sweets around here and I did agree that a pie would be quite tasty! Two weeks ago we were reading “[amazon_link id=”0679880836″ target=”_blank” container=”” container_class=”” ]How to Make Apple Pie and See the World[/amazon_link]” for Tonchi’s school. I also told them that sometime that week we would make an apple pie and they could make it. 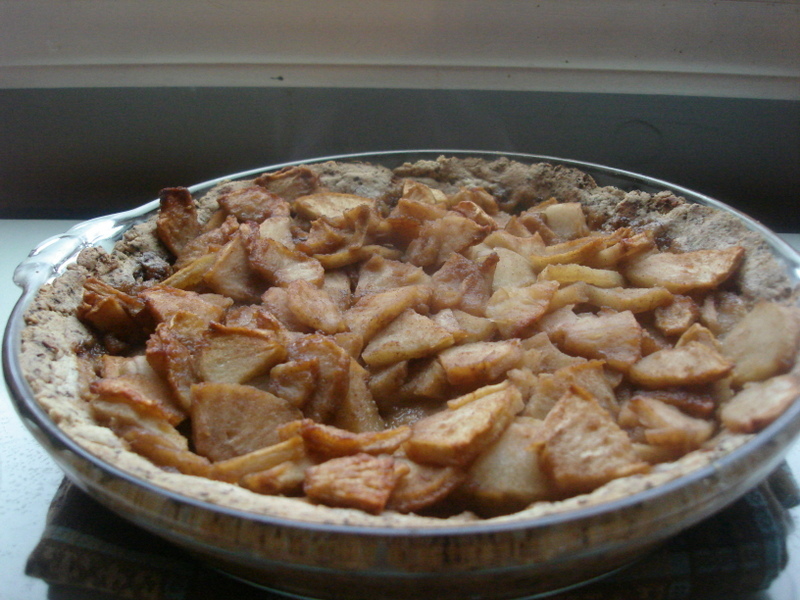 I made the crust, Koa peeled, cut and cored all the apples and Tonchi mixed up the filling. The pie tasted SO good and Tonchi made the filling himself! Maybe he will be a chef one day! Koa put all the apples in the mixing bowl and I gave Tonchi the rest of the ingredients and had him add it together. I gave him free reign with the ingredients and he really did a fantastic job! I estimated what he added so that maybe you can benefit from the extraordinary filling he made, but I’m sure they aren’t exact since I wasn’t paying 100% attention. At one point while he was mixing away he says, “We need more cinnamon in here, Mama. Can I add more?” I reminded him it was his pie and if thought he needed more, then that was fine! He added some more and then proclaimed, “That should be perfect!” And I think it was! Coat 9 inch pie pan with coconut oil. Blend in [amazon_link id=”B00004S9EM” target=”_blank” container=”” container_class=”” ]food processor[/amazon_link] dates and almond flour and coconut oil until just shy of making butter. Press into pan with fingers and spread halfway up sides. Bake at 350 for 10-15 minutes until golden brown. Mix until apples are coated with ingredients. Cook at 350 for about 1 hour or until apples are soft. Maybe the trick to having a fantastic apple pie is letting a 5 year old mix it up! Mmmm it sure was good! This is a great recipe. Delish! Thanks!!!! Just made it today with some apples from my CSA. Next time I’ll only cook the crust <10 min. I think mine came out too dark once it was all cooked (about 12min).